These healthy whole wheat waffles are packed with protein, hidden pureed veggies, oil free, and naturally sweetened with honey. The perfect healthy breakfast for your kids and family. Using a stand mixer mix together flour, baking powder, salt, cinnamon & wheat germ. Add the wet ingredients: vanilla, honey, applesauce, eggs, puree, yogurt, & milk. When adding wet ingredients mix between each addition. Spray waffle iron with oil and depending on your waffle iron add the correct amount of waffle batter. Mine takes around 1/2 cup of batter. I learned that my waffle iron takes longer than normal to make the waffles good and brown on the outside and nice and fluffy on the inside. You will have to experiment with yours to get the perfect done-ness. 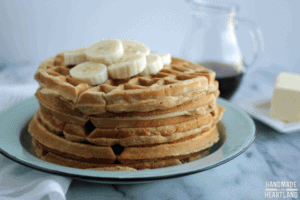 Serve with pure maple syrup, bananas or other fruit toppings! A note about the puree, I will cut up a bunch of carrots and a sweet potato or two and steam them and then puree them in a blender, after that I keep them in 1/4 cup increments in the freezer and pull them out when I feel like I can add them to a recipe. Pretty much anything baked I can pop them in, or spaghetti sauce or quesadillas, etc. It may not be a lot but every little bit of veggies helps! If you don't have time to make your own puree grab a can of baby food at the grocery store. Add in 1/3 cup of chocolate chips to the batter for a sweeter waffle.